And the wait is finally over. 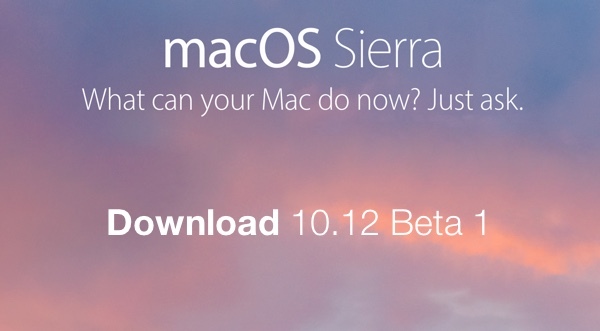 Apple’s macOS Sierra version 10.12 beta 1 is now live and available to download and install for developers. Those of you who are enrolled and registered on Apple Developer Program portal can instantly grab the latest beta version of desktop OS from Apple right now. As for those testers registered on the free Apple Public Beta Program, the company has also confirmed that macOS Sierra will be available to public testers sometime next month in July. We’ll obviously let you know as soon as the the public beta goes live for download. Following the rumors that Apple could change the name of its desktop OS, we now have official confirmation from Apple, and so can start referring to company’s desktop OS as macOS instead of OS X. Part of this announcement at the WWDC 2016 also includes macOS Sierra beta 1 being made available to download and interact with. When people say that you “can’t please all the people all the time”, it’s most definitely true. Apple may have chosen to scrap the “OS X” naming convention in favor of a more converged “macOS”, but the release doesn’t appear to be the huge overhaul that some people had hoped for prior to this announcement. Yes there are some notable additions, like Siri making its debut on desktop, but not a lot has changed in terms of overall interface. With that said, macOS definitely does build on the foundation that’s been laid in place with the last couple of major versions of Apple’s desktop platform, and for that we can be thankful. Developers looking to grab the beta release of macOS Sierra 10.12 need to be registered and enrolled member of the Apple Developer Program at developer.apple.com. As for compatibility, most modern Macs, including the iMac, MacBook, MacBook Pro, MacBook Air, Mac mini, and Mac Pro, are capable of installing and executing the latest macOS. For full compatibility, check: List Of macOS Sierra 10.12 Compatible Macs. As for when the final version will be made available? Apple generally has a habit of releasing new versions of its desktop platform alongside the public release of the latest version of iOS. To that end, we’re expecting Apple’s new iPhone 7 to drop in late September, which will be the first device to ship with iOS 10. It’s reasonable to assume that Apple will release the final version of macOS Sierra to public at the same time. Until then, sit back, put your feet up, and enjoy the beta ride that will inevitably see multiple pre-release seeds hit the airwaves over the next few months before we get that final public release somewhere in September. Where did you download it from? Everywhere I have tried has not worked. Check the /r/piracy subreddit there are links. Can you explain step by step ? 4. From the contents of the OS X Install ESD open (mount) BaseSystem.dmg (default BaseSystem.dmg Basesystem.chunklist and hidden. Use the utility “ShowAllFiles”). If you do not – get an error Undefined error: 0 at the very beginning of the installation! 9. Now you can install macOS Sierra on your Macs. Does the new Apple File System, APFS, support NTFS read/write out-of-the-box ? I downloaded it and extracted it to a bootable USB and it has critical errors at about 90 percent into the install. I got as far as 90% during the actual install of the software and it had a critical error and missing files. Did this about 3 times and deleted the file. I’ll wait for one with a built in installer. Trouble with the file downloaded from Mega? I should have taken a screen shot of the error log. It says 20 minutes to install and then hangs with 6 seconds left and doesn’t install anything. OK I’ve done this procedure 10x and have been doing this process for years now and this file has to be corrupt. It hangs at 1 minute left in the installation every single time, or 43 seconds. that’s not how that works… APFS is a file system, NTFS is a file system. They are different. The inclusion of APFS in no way affects how NTFS is or isn’t handled by the system. NTFS requires its own driver. Does anyone know how to get pass the “unable to verify” screen?